"I don't want to tour Myanmar," my wife's colleague shook her head vigorously. "I want to go to Japan." "Why don't you like Myanmar?" I was doing my survey as I have now been given a travel agency licence by the Singapore Tourism Board. This slim lady in her 40s could afford any trip as she had no husbands or children to support. She is the aunt whom nephews and nieces love as they get lots of love. One day she shocked me by saying, "I don't want to be associated with my nephews and nieces when I bring them to the Bishan Community library. I stayed far away from them." When I asked why, she laughed, "They are a noisy bunch". Fortunately, Bishan's community library for the children is in Basement Two. This is one library where the energetic progenies do not upset the others as they read and run wild. Many Singaporeans are not keen on touring Myanmar and you can see that there are practically no advertisements on Myanmar tourism in Singapore's Straits Times. "Too many potholes," the wife's colleague said. "Not comfortable travel." I looked at my wife, "You have sabotaged my start-up business." 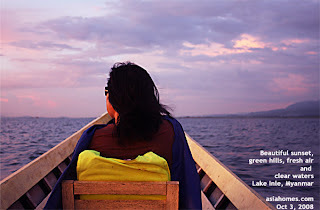 She said, "The sunset of Lake Inle is so beautiful. Green hills on one side flowing past, calm waters. The sky's colour and hue are incredible..." Lake Inle will win the hearts of the office ladies of Singapore. 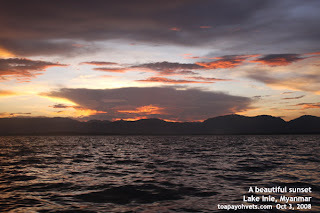 Before I could speak further, my wife asked me as she remembered my 2nd trip when my new Canon EOS 40 malfunctioned halfway during the visit, "Did you manage to take some pictures of the sunset of Lake Inle successfully? Did your camera malfunction due to the bumpy rides in Myanmar?" She associated rough rides to the damage to the Canon camera. I was holding the camera all the time, ready to take pictures. During my second trip, the camera could not focus. I should have brought more than one lens and camera - a lesson to be learnt. "Yes," I said. I post three pictures here as the others are in other parts of the blog. Lake Inle is to be experienced as words fail to describe the serenity and beauty. Lake Inle is worth at least 2 nights' stay to explore the villages and to hike. October is a good month but October to April should be good as the climate is cool. 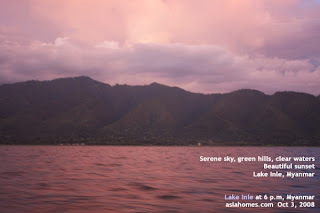 Any office ladies or adventurers interested in making up a group of 6 to visit Lake Inle, tel 9664-0404, 9668-6468 or e-mail to judy@asiahomes.com> for a further discussion. The "danger" is only some bumpy rides in certain roads of the outlying districts.